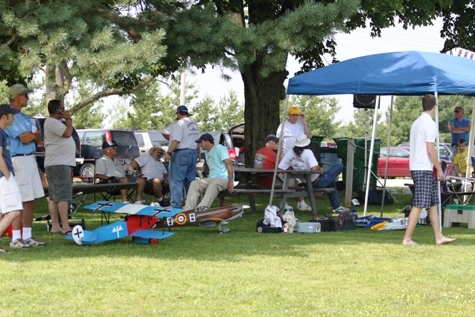 Welcome to the 2010 Blacksheep Warbird Fly-in. Wow! 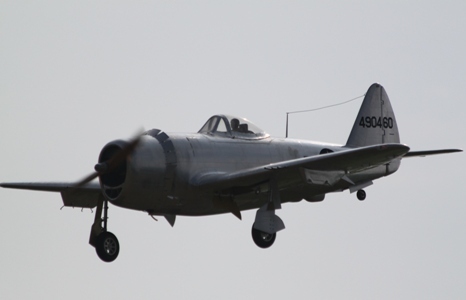 What a great day for the 2010 Blacksheep Warbird Fly In. 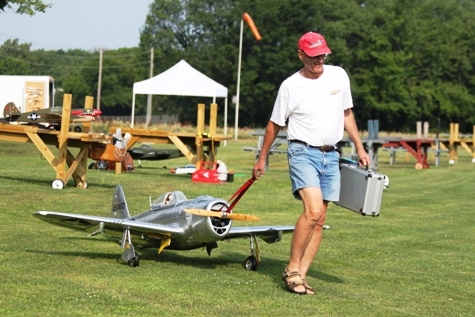 We had 21 registered pilots with over 35 airplanes of all sizes and eras. The skies were hazy and hot and humid and a little windy almost due south. But, did not damper the good time had by all. 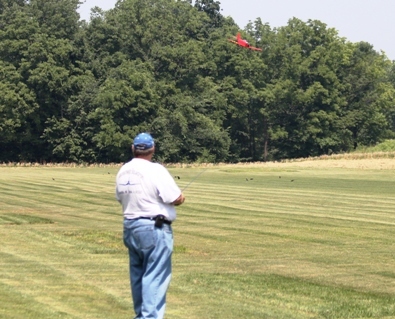 We had the most spectators that I can remember, almost an airshow atmosphere. We had over 60 for lunch, special thanks to Randy McKee and Ray Turner for the ribs and grilling duties. And special thanks to Jan McKee, Courtland Torres, and Jaymee Hall for taking concession stand duty. While on special thanks, Tony Bowling, Vern Hines, Don Tropsper and Bryan Baumer for getting the field in such great shape. Once again, all Blacksheep - great job. 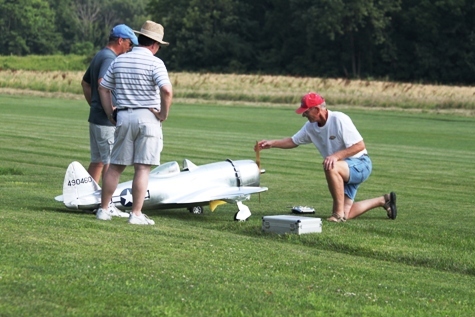 Sam Parfitt from the Cincinnati area brought three beautiful aircraft that are works of art. 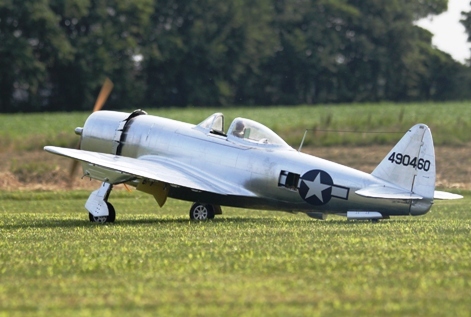 A chrome finished P-47 with tons of working scale details, including remote operated canopy and all working lights. He had his Beechcraft 18 (done in C-45 military colors)and P-61 twins. He also had a turbine powered F9F Panther he taxied around. 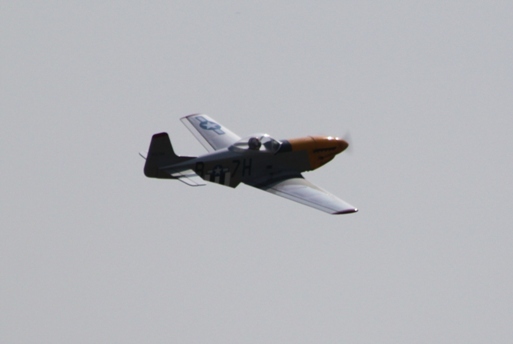 Several Mustangs and other warbirds that guys do not routinely bring out were flying today. 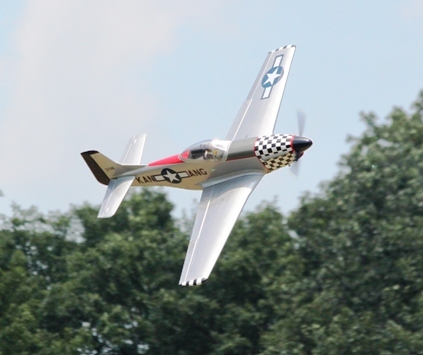 Rege Hall flew his Top Flight 85" P-51. John Louden flew his Great Planes 1/12th scale Corsair several times with Parker Hall and his 1/12th Mustang, the two are very fast, can't imagine flying combat with these. 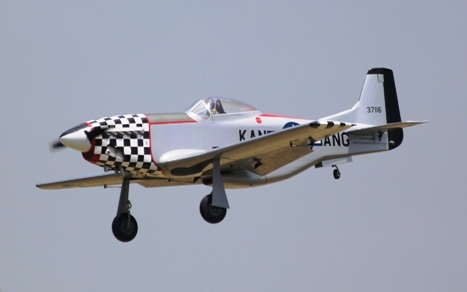 Matt Shelton, Don Schmedake, Wayne Jones and Mike Whitmore also had Mustangs and Joe Kosiba had an old Top Flight P40. Rege Hall flew a 70 mm EDF F-16 with vectoring thrust, really wild tumbling maneuvers and also a EDF F-86 like we had for the raffle. 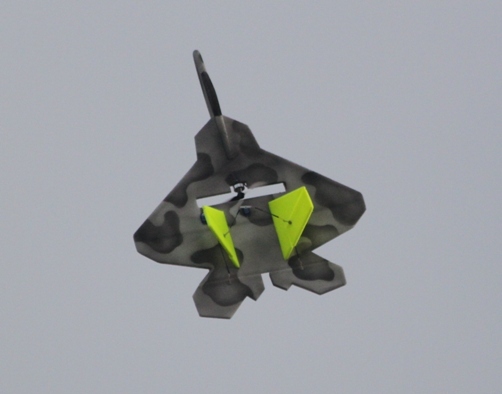 The most popular warbird was the flat foamie F-22 Raptors. We had at least 9 of them today. 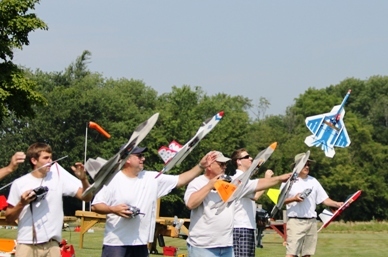 Several times we had 6 or 7 in the air practicing pylon racing. 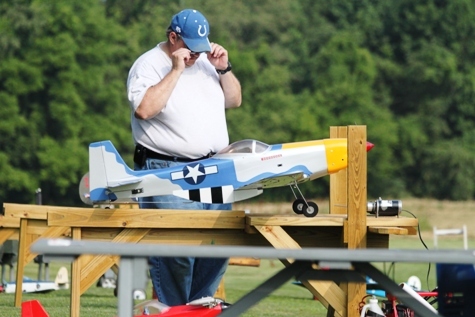 Blake McBee and Parker Hall flew their Thunderbird schemed several times showing the full range of capabilities of these cool little planes. Pilots Choice - Sam Parfitt for his P-47. Directors Choice - Sam Parfitt for his C-45. All very deserving and received a very nice plaque to commemorate the award. 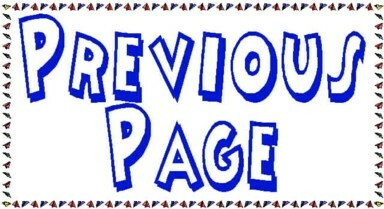 click on any of the thumbnails for a larger view. Then click back to go back to the pictures. 1. 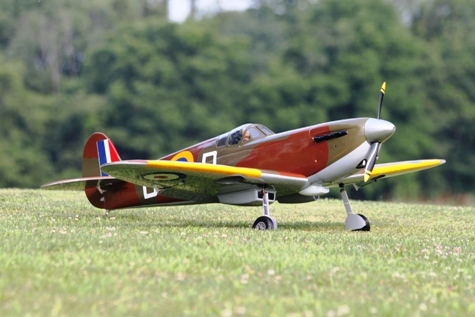 Rege Hall's Hangar 9 Spitfire, 65" wing span, retracts, flaps and powered by a Saito 1.00 4 stroke. 2. 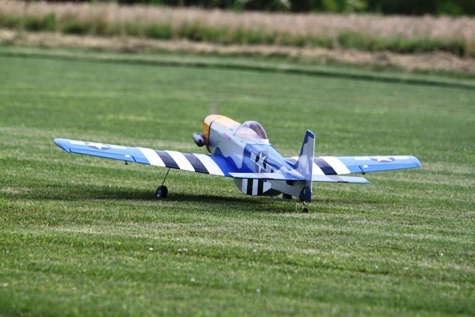 Don Schmedake's Nitro Models 66" wing span P-51 he won at last years warbird fly in. Powered by an MDS 68. 3. 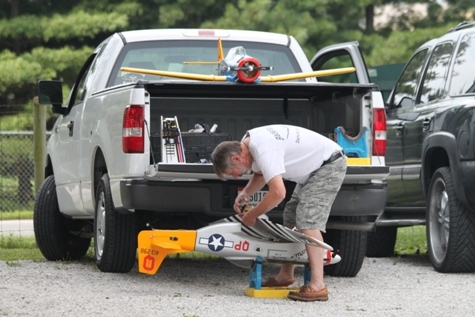 Mike Whitmore putting together his Hangar 9 Mustang as the T-6 rests ready to go to the flight line. 4. 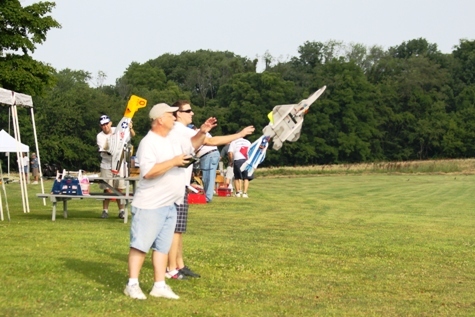 Dave Miller and Parker Hall launching their F-22's. 5. 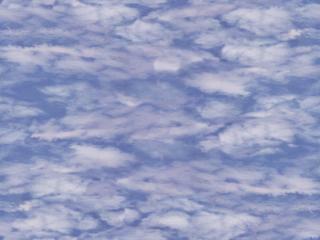 Dave Miller's F-22 into the blue. 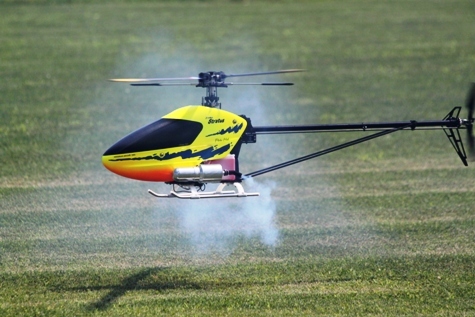 Man, those bright yellow fins show up! 6. 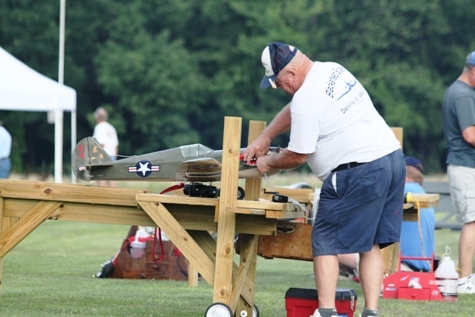 Joe Kosiba getting his Top Flight P-40 ready to go. 7. 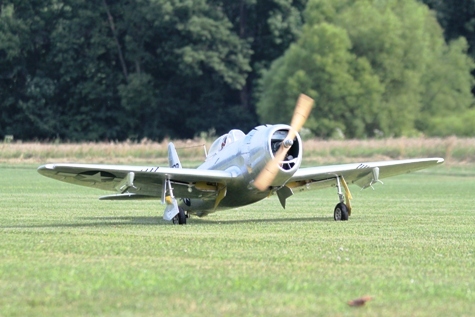 Wanye Jones taxiing out his P-47 foamie that David got him for fathers day. 8. 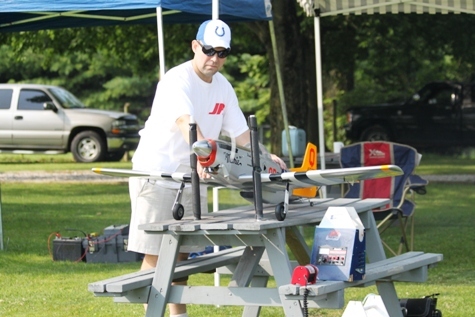 Matt Shelton starting his Hanger 9 Mustang, pored by a Saito 1.20 four stroke. 9. Sam Parfitt leading his P-47 to the starting area. 10. Matt Shelton and the dreaded Mustang walk. 11. Don Schmedake putting the eye on his Mustang prior to start up. 12. Sam Parfitt starting his P-47 as Bryan Baumer and Tom Carlyle assist. 14. 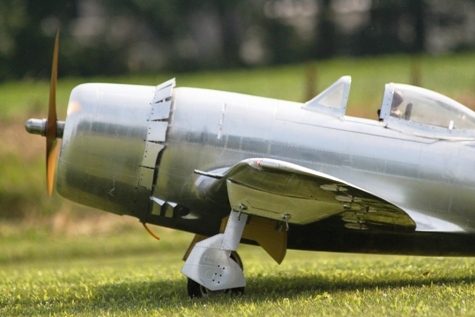 P-47 powered by a 3W 75 and loaded with scale options. 15. a close up of some of the fantastic details on Sam's P-47. 16. The P-47 coming in low and fast for landing. 17. 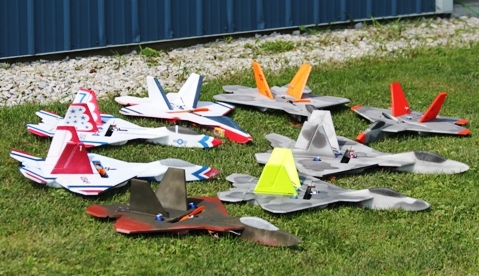 A shot of 8 of the colorful F-22's. 18. Power end of Bryan's newly finished Fokker DVIII, it has come a long way from when he took over Francis Feeney's project. 19. 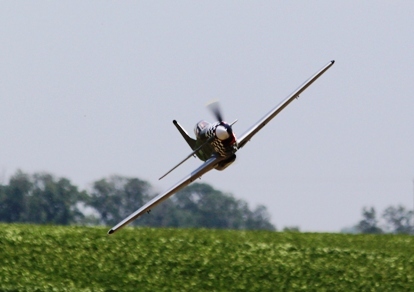 Ray Courtney launching John Louden's Great Planes Corsair, powered by an OS 25. 20. 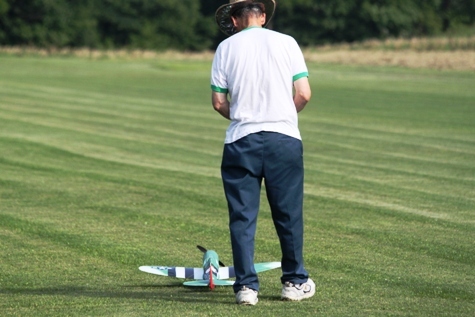 John Lawyer getting ready to launch his small foam Sea Fury. 21. 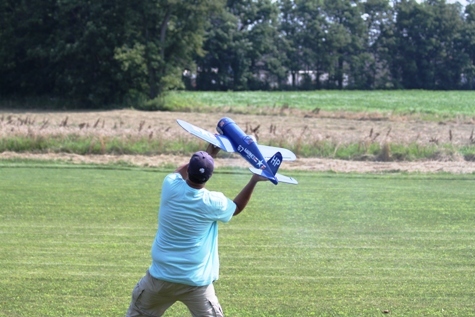 Parker Hall's Great Planes 1/12th P-51 Mustang, fast! 22. Flight line, notice everybody staying in the shade. 23. 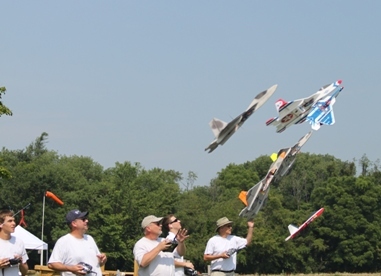 F-22's launching for a mission, Ralph McBee, Blake McBee, Rege Hall, Dave Miller, Parker Hall and John Louden. 24. Would you believe no mid airs here? Saved them for later in the flight. 25. 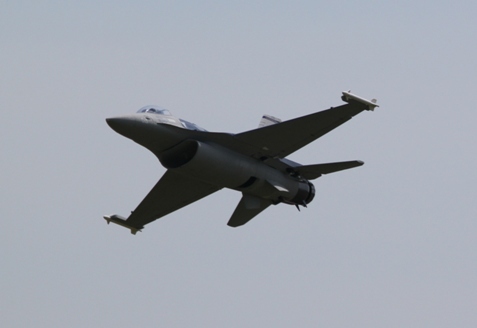 Rege Hall's Hobby Lobby F-16 EDF with vectoring thrust. Wild tumbling and a cool cobra. 26. Parker Hall's Stratus for a noon demo, had a control link fly off on a violent pull up from inverted and then a great save. 27. 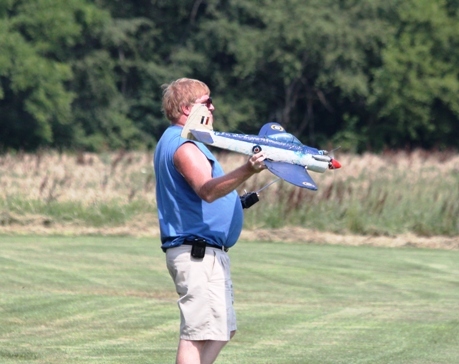 Don Schmedake bringing in his Jemco Fun Scale P-51, older kit and flies like a sport plane. 28. 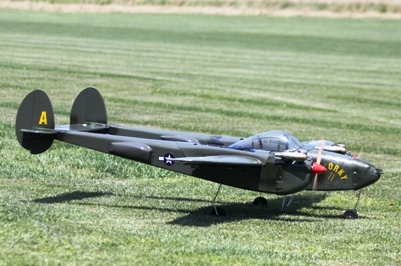 John Lawyer's Nitro Models P-38 with counter rotating K&B 61's, nothing like the sound of a twin. 29. 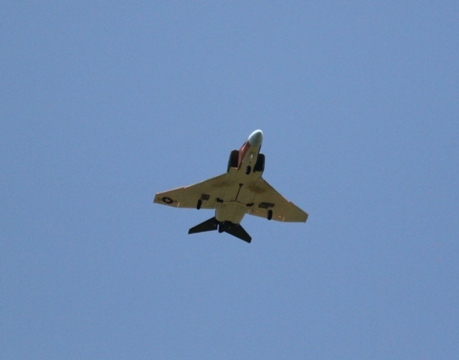 Weir Thurman's F-4 Phantom 70 mm EDF jet, flies fast and looks good in the air. 30. 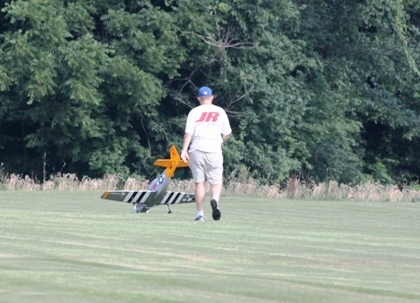 Rege Hall's ZDZ 40 powered 85" Top Flight Mustang coming in low and fast. 32. Flaps down, gear down coming in for a landing. 33. 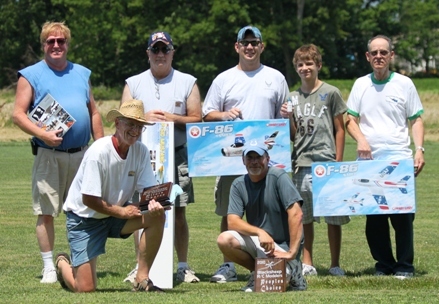 The days winners: standing L - R: John Lawyer, Vern Hines, Vic Hasstedt, Tim Hasstedt, Wayne Jones. Front row L - R: Sam Parfitt and Bryan Baumer. 34. 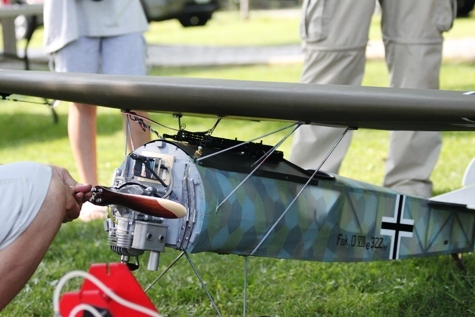 Bryan Baumer with his People's Choice plane, a DLE 30 cc gas powered Fokker DVIII. Hold this date for next years warbird fly in.